Virtually all the time, the foundation for a historically great team is built over several years. 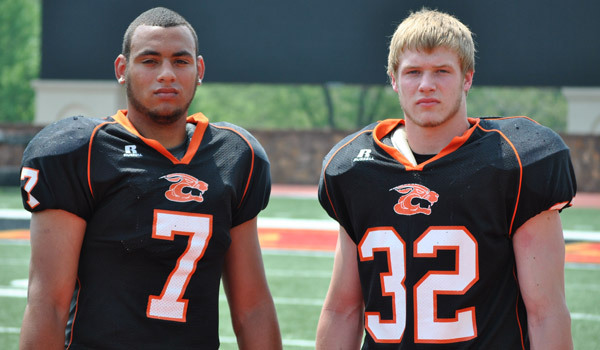 The 2013 Centralia/Wetmore squad certainly fits the mold. Two years ago, the Panthers started 1-3, but won nine straight, including a 20-14 overtime victory against La Crosse in the state championship game. Centralia graduated virtually everyone from that team, including Shrine Bowler Michael Glatczak. Still, the Panthers made it back to state last season with a very young and inexperienced squad and lost 28-25 to Meade in the final seconds. After the game, coach Larry Glatczak was already pointing to 2013 and a bevy of returning talent. This fall, the Panthers returned nine offensive starters and 11 on defense, including four seniors – quarterback/safety J.T. Rosine, tailback/linebacker Sam Steinlage, end/linebacker Brett Burdiek and wingback/cornerback Devin Rempe – who also started as sophomores. Plus, the Panthers have had multiple players improve and step up in key roles. The process has produced statistically one of the greatest 2-1A teams in Kansas history. Centralia has outscored teams 599-67, leads the classification in scoring offense and defense en route to a 12-0 start. On Saturday, the Panthers have an opportunity to close out a perfect season when it plays La Crosse (12-0) in the state championship at Fort Hays State University’s Lewis Field Stadium. Start time is 1 p.m. Centralia is looking for its third state crown. The Panthers ended Smith Center’s 79-game run with a 20-12 overtime victory in 2009. La Crosse, a powerhouse for the last 15 years, has yet to win a state crown. The Leopards overcame the loss of junior lineman Sheldon Schmidt to a season-ending knee injury in Week 4 and lost special teamer Alex Jay in the first round of the playoffs. Fifth-year head coach Jon Webster has mixed and matched and starts three freshmen, two whom moved into the lineup during the season. Senior Marshall Jay, the team leader with 96 tackles, took over at running back in midseason and rushed for 90 yards on 20 carries, both team-highs, in last week’s sub-state victory against Meade. Jay is the lone starter back from 2011. Senior safety Taylor Yohe also saw some time in the state loss. Junior quarterback Jack Garcia leads the team with 88 of 155 passing for 2,041 yards with 31 scores against seven interceptions. Four players have between 406 and 860 yards on the ground. “As much success as we have had throwing the ball this year, our kids still take pride in running the football,” Webster said. Centralia didn’t allow a point until Week 4, and defeated Oskaloosa 56-8, Olpe 36-0 and Lyndon 69-21 in the playoffs. Unlike La Crosse, Centralia has had no injuries and Glatczak said he hasn’t needed to make any personnel changes. Centralia led previously undefeated Lyndon 27-0 midway through the first quarter and 54-0 at halftime. The Panthers, which kept the starters in for just a half, threw just one pass, but rushed for 507 yards on 35 carries. Steinlage, the team’s leading rusher with 1,254 yards and 23 scores, had five carries for 24 yards and a TD and also returned a punt for a score. However, the Panthers showed their depth in the single-wing offense has six players scored touchdowns. Rosine collected seven carries for 171 yards and three TDs, while junior fullback Trevor Mars had nine carries for 146 yards and two scores. Rosine has rushed for 1,070 yards and 16 TDs, and thrown for 542 yards with a 6/0 TD/INT ratio on 25 of 48 passing. Defensively, they continued Lyndon’s senior duo of Joe Walsh and Josh Owens to 183 yards on 35 touches. Senior Hunter Haufler, a starting lineman emerged toward the end of 2012 and has stepped up this season with a team-high 7.5 sacks. Junior lineman Joey Ferron played well as a sophomore and collected all-state recognition, while sophomore lineman Nick Howerton has also had a nice season for a team that’s been ranked No. 1 all year. Steinlage leads the team with 97 tackles, while Burdiek ranks second with 83 stops and Ferron third at 44. Burdiek enjoyed a big first quarter against Lyndon and led the team with nine stops.